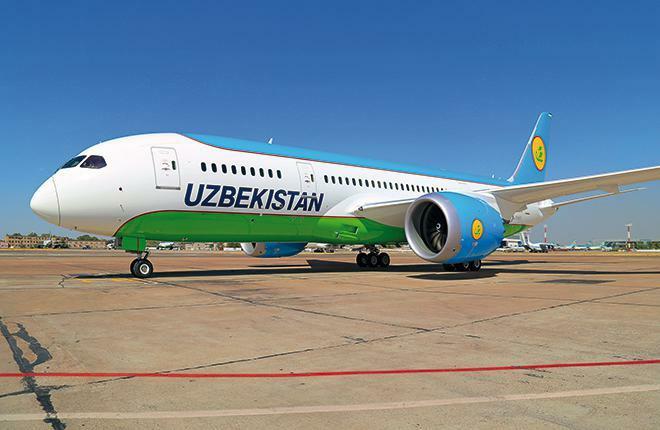 The Uzbek national airline, Uzbekistan Airways, and Boeing corporation signed an agreement on the delivery of another Boeing 787-8 Dreamliner, the airline's press service reported. Taking into account this additional aircraft, the national air carrier of Uzbekistan will have six airliners of this type in its fleet until 2020. The third Dreamliner, which is expected to be delivered in mid-May, differs from the previous two Boeing 787-8 Dreamliners operated by Uzbekistan Airways, with an increased number of seats for passengers and a special compartment for the rest of the crew. The total number of seats on this aircraft is 270 (business class - 24, economy class - 246). On this liner, as well as on other Boeing 787 Dreamliner aircrafts, GEnx-1B GE Aviation engines are installed, providing better fuel efficiency, low noise level and minimum level of CO2 emission into the atmosphere. The airline launched commercial operation of Dreamliner in 2016. On July 27, 2017, the national air carrier of Uzbekistan performed the first non-stop flight from Tashkent to New York on this type of aircraft. Uzbekistan Airways transported more than 2.703 million passengers in 2017. Last year, Uzbekistan Airways performed 22,950 flights compared to 22,387 flights in 2016.